The U.S. Armed Forces have established a complete and convenient logistics system to support the wars. The supplies include various items from daily personal demand items to weapons and equipment. These items are used to support the fights of frontline troops as well as the special forces deep into enemy territory. 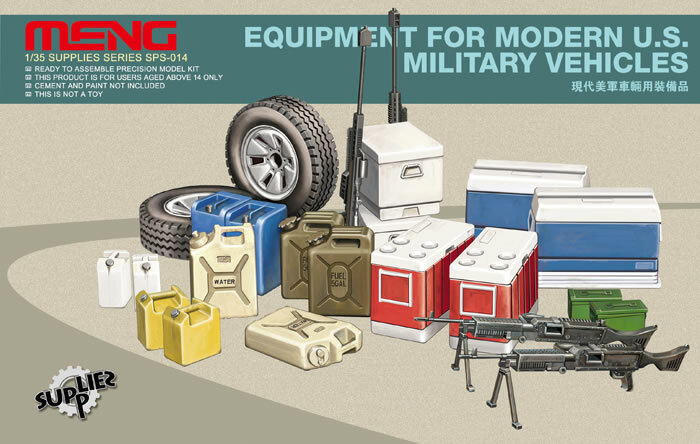 This 1/35 scale SPS-014 Equipment for Modern U.S. Military Vehicles kit consists of 80 parts for the following items: 3 kinds of coolers, 2 of each; military water containers and Jerry cans, 2 of each; civilian fuel cans of 3 sizes, 2 of each; Barrett M82 anti-materiel rifles, 2; M240 general-purpose machine guns, 2; 200 rounds ammo cans for 7.62×51 NATO cartridge, 2; pickup wheels, 2. You can make your models look more unique and interesting by using this kit.